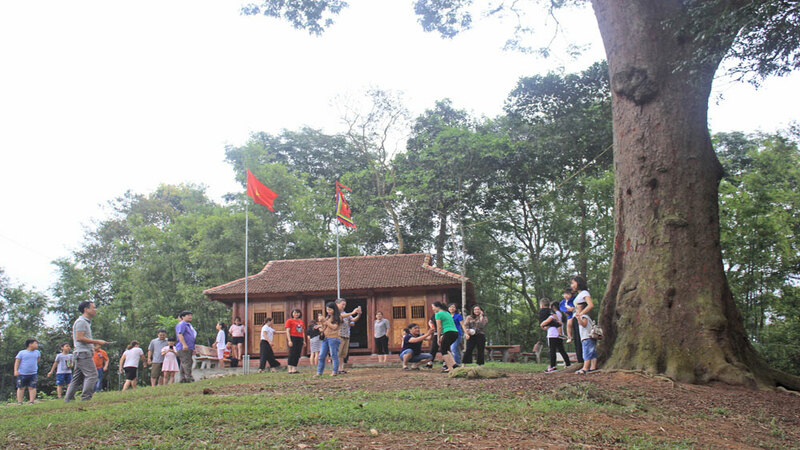 (BGO) – This year, the Bac Giang provincial Center of Information and Tourism Promotion has deployed a lot of programmes to support Thac Nga (Nga waterfall) Xuan Luong tourism site in Yen The district, realizing the Project of developing the local community based tourism for the period of 2014 – 2020. Tourists admire the giant ancient ironwood of thousand years old in Nghe hamlet, Xuan Luong commune (Yen The district). Photo: Tuyet Mai. Particularly, the programmes support several facilities, install free instruction sign; train the skills of reception, narration, tourist guidance, exploitation of provincial cultural and cuisine values whereas offering the trial tours of local attractions to foreign visitors and travel agencies. Step by step, these activities help establish and develop the community based tourism models with a close linkage to ecology and spirit, creating favorable conditions for the visitors to enjoy the local destinations. Thac Nga ecological tourism site in Xoan hamlet, Xuan Luong commune is about 23 kilometers away from the center of Yen The district. It is one among the favorite attractions in the district. The site was formed by several waterfalls of Deo Nga, Deo Da and Ranh Coc with an average height of 15 to 30 meters, covering some 400 hectares in the middle of the jungle. Besides, visitors can admire the old architecture like Mo pagoda, Xuan Lung pagoda or vast lakes as Ngac Hai lake, Suoi Ven lake and Quynh lake. These surrounding landscapes create a unique weather climate to Thac Nga with a lower summer temperature of 3- 5 degree than the adjacent regions that is an ideal condition for the hot day visit.